Investigation into material and process led practices through cross-disciplinary workshops, seminars and writing, predicates my art-work. This dual approach of direct research into the boundaries and preconceptions of the visual arts, coupled with my own artistic practice, allows me to create a critical discourse that surrounds my own sculptural territory; one that sits firmly in the middle of the ‘expanded field’ of inter-disciplinary, material-specific making and fine art sculpture. 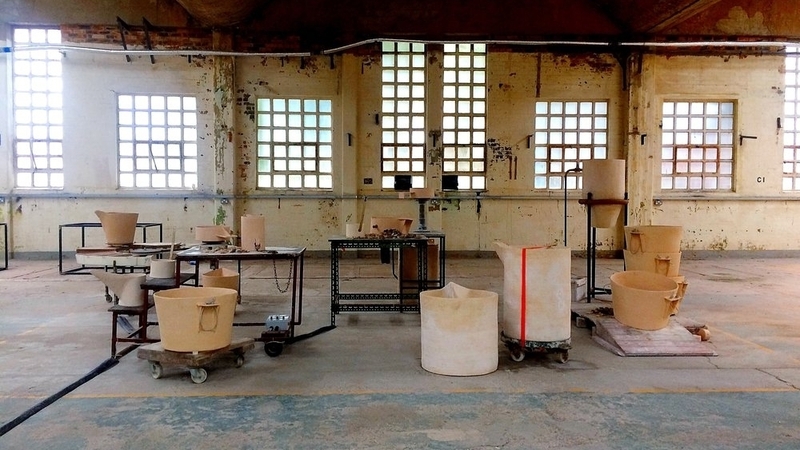 Using clay as a primary material language, the studio becomes a site of reflexive and subjective making. Through attention to the generative tendencies and tensions between the private and performative nature of studio practice, I explore the territory of risk and the place of migration between state and thought. The development of an object-orientated ontology creates an intimate relationship between object, environment and maker, where repeated actions and forms deconstruct the in-between space of life, the body and art. Analogies to the body run through the work with playful references to ‘jugs’ and the inherent anthropological language used to describe vessels – the foot, the waist, the lip. Newer work has begun to inhabit the notion of potential, with objects seemingly unfinished or ‘raw’, where the audience is invited into a corporeal and visceral environment of mind-body boundaries and material. As the landscape of the work is built up and developed, it is punctuated by and responsive to the viewer, exploring the idea of language as matter: a transitional space that uses making and process to explore the body and lived experience.